A Closet for Limitless Adventure, Limitless Possibilities: Nail Art, Anyone? One of the things I can't live without is pedicure. Gosh, I can go to the parlor every week just to have my toenails done. But, I don't sport loud colors since I don't wanna look silly with my colors. hahahhahah! But, nail art has been very popular that there nail stick-on art can just be bought from stores. Parlors however, are mushrooming with nail art as one of their forte. 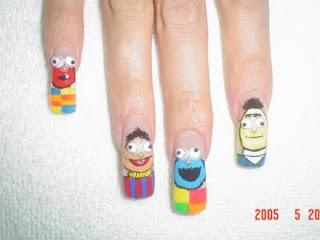 Just check out this funny picture of nail art with my favorite SESAME Street characters.